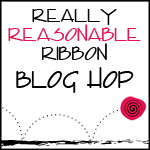 Welcome to the RRR March Blog Hop. If you arrived here from Jeanne’s awesome blog, you are on the right track. If not, why not head back to the RRR Blog and start from the beginning so you don’t miss any of the terrific projects. This month the Really Reasonable Ribbon Monthly Ribbon Club Assortment is a fun mix of dark pinks and greens we’re calling ‘Sweet Pickle’. It’s a fun and bold color assortment which works for lots of different occasions. If you love ribbon, the Monthly Ribbon Club is a great way to build your stash. You get a fun new color or holiday themed assortment each month. Such a pretty little present to treat yourself with once a month!! Today I have an Easter Card for you using some stamps from Easter Egg Words and Bunnies set from Peachy Keen stamps and several ribbons from the RRR March Ribbon Club Assortment. I ran a layered strip of ribbon down the middle of the card (Garden Rose Swiss Dots over Deep Sage Satin w/Grosgrain Edge), then finished it off with a big criss-cross bow made from the lightweight Rose Bloom Stitched Ribbon. All ribbons used are from the March Ribbon Club assortment. Your next stop is Ava’s wonderful blog. Your card is sooo darn cute! TFS. I love these papers and these projects. What a sweet card! Love that gorgeous bow! What a pretty Easter/Spring card. Wonderful stamps, coloring and use of ribbon. Thanks for sharing such great inspiration! Such a pretty card and love the paper and sketch. Adorable. Love that big bow!